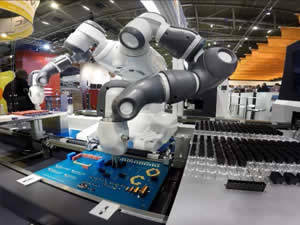 QComp engineered cells with assembly robots are capable of high speed assembly and inspection of various components. We can also integrate various materials handling equipment to complete your application, providing worry-free turnkey service for you. The cell shown to the left incorporated high speed vision, pick and place robot, component feed systems, and the precision transport conveyor for the fixtures to be assembled.